'all that we seem to have acquired is the potential ability to select from an animal any of the antibodies of his repertoire. It is somewhat like selecting individual dishes out of a very elaborate menu: antibodies 'à la carte'... A gastronome worth his salt... wants to experiment with new ingredients, new combinations. His dream is to invent new dishes and not only to taste what others are doing. I am sure our next step will be to move from the dining table, where we order and consume our antibodies 'à la carte' to the kitchen, where we will attempt to mess them up.' (C. Milstein, 'Monoclonal antibodies from hybrid myelomas: Wellcome Foundation Lecture 1980', Proceedings Royal Society of London, 211 (1981), 393-412, 409). As these words suggest, from the time that Milstein first developed the hybridoma technique with Köhler, he began looking for ways to improve the technology. This diagram illustrates the basic protocol developed by Köhler and Milstein for making monoclonal antibodies. It was first published in G. Galfré and C. Milstein, 'Preparation of monoclonal antibodies: Strategies and procedures', Methods in Enzymology, 75 (1981), p.15. 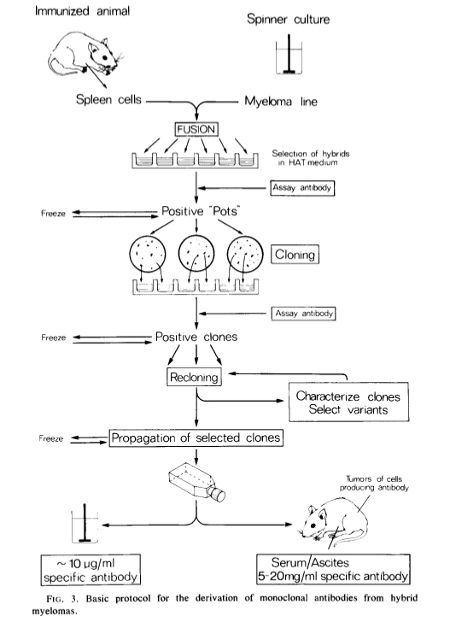 By the late 1970s, most monoclonal antibodies were being generated by using the protocol in the diagram shown here. Such monoclonal antibodies are produced by fusing animal myeloma tumour cells with spleen cells derived from mice or rats previously immunised with an antigen. Monoclonal antibodies created in this way are known as murine monoclonal antibodies, denoting their rodent origin. The advantage of murine monoclonal antibodies was that they could be made to target almost any antigen and in vast quantities. Indeed, the rodent system possessed great flexibility to generate an antibody with any number of determined specificities. The system, however, had a downside: it produced non-human antibody molecules. Seen as foreign by the human body, such antibodies ran a high risk of prompting adverse immune reactions if administered to patients. Moreover, these adverse reactions could result in the rapid destruction and clearing of the monoclonal antibody from the body, which reduced their effectiveness for therapy. Early on, Milstein and his colleagues had attempted to generate human monoclonal antibodies. This, however, had proven both very difficult and impractical. Manifestly, humans could not be immunised and manipulated like laboratory animals. Immunising humans with cancer antigens for the purpose of raising human antibodies against cancer to be converted into monoclonal antibodies, for example, was full of risks and raised serious ethical concerns. By the late 1970s, when scientists were grappling to produce more human-like monoclonal antibodies, Milstein began to encourage his colleagues to think about using recombinant DNA (rDNA), or genetic engineering, to solve the problem. First devised by Stanley Cohen at Stanford University and Herbert Boyer at the University of California in 1973-74, the technique involved using restriction enzymes to isolate a DNA fragment containing a gene of interest from an animal cell and then fusing this with a bacterial plasmid (an independent, self-replicating DNA molecule) that had been cleaved open with restriction enzymes. This method created what was called a recombinant DNA molecule, or rDNA. Once made the molecule could be put into a bacterial cell for amplification alongside the host cell DNA. This diagram shows the steps involved in making rDNA. Milstein argued that by combining genetic engineering with hybridoma technology scientists could shift from being restricted to immortalising naturally occurring antibodies as he and Köhler had done, and begin to design tailor-made antibodies. He believed this method could provide a way of engineering the human antibodies scientists had so far failed to produce. One of the advantages scientists had in using genetic engineering to improve monoclonal antibodies was that antibodies possess a basic uniform modular structure. This meant that scientists could cut genes present on one part of the antibody and paste them on to the constant region of another antibody. For many scientists steeped in antibody research and immunology, such a shuffling of genes merely mimicked what already happened naturally in the immune system. Milstein himself would make relatively modest efforts in the application of genetic engineering to monoclonal antibodies. Nonetheless, his vision inspired many others to begin the process. This included Michael Neuberger and Gregory Winter based at the Laboratory of Molecular Biology. They were instrumental in developing techniques for re-engineering monoclonal antibodies. This helped reduce their non-human protein components, thereby enhancing the efficacy and safety of monoclonal antibodies for use in therapeutics. With Milstein's encouragement, the process for making monoclonal antibodies underwent a radical transformation over the next few years yielding antibodies that were much more compatible with the human body. By the 1990s scientists had gone a long way towards remoulding the basic monoclonal antibody first developed by Köhler and Milstein. This photograph captures Milstein (far left) talking to Michael Neuberger (centre) and Gregory Winter (far right). Photo credit: MRC, Laboratory of Molecular Medicine. With antibody engineering, scientists and clinicians found a way of producing a much safer and effective form of monoclonal antibody, one that could be used as therapeutically for many different diseases. Today monoclonal antibody drugs account for a third of all new treatments being introduced worldwide, and are beginning to bring in far greater revenue per product than older and more traditional small molecule pharmaceutical products. They have also been more successful in completing clinical trials than small molecule drugs. Learning from past mistakes, both the Laboratory of Molecular of Biology and the Medical Research Council ensured patents were filed for the re-engineered forms of antibodies generated. This has generated an important source of revenue. To date the estimated MRC net income from monoclonals is £360 million (after deduction of revenue share and awards to inventors). 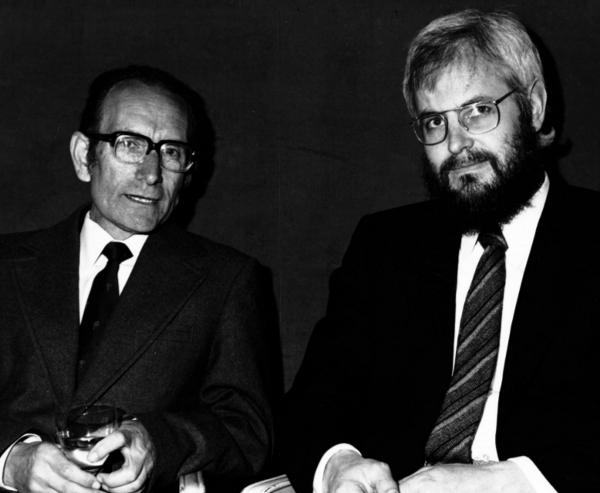 This shows Milstein with Köhler at the time of their receiving the Nobel Prize in 1984 together with Nils Jerne. Photo credit: MRC, Laboratory of Molecular Biology. In 1975 Milstein was elected a Fellow of the Royal Society. Two years later he was awarded an honorary doctorate by the Universidad Nacional del Sur based in the city of his birth Bahía Blanca. This was given in recognition of his contribution to science. Milstein received several other awards after this, including the Wolf Prize in Medicine in 1980, the Royal Medal in 1982, the Lasker Award in 1984 and the Copley Medal in 1989. He was jointly awarded the Nobel Prize in Physiology or Medicine in 1984 with Georges Köhler and Niels K. Jerne 'for theories concerning the specificity in development and control of the immune system and the discovery of the principle for production of monoclonal antibodies'. By the time the Nobel Prize was awarded to Milstein and his colleagues, monoclonal antibodies had become a ubiquitous method for researchers in a multitude of disciplines. The technology not only provided the tool for those involved in basic science, but also for those looking to develop new diagnostics and therapies. Some idea of how valuable the technique had become can be seen by the fact that as early as 1980 the British biotechnology company, Celltech, calculated the world market for monoclonal antibodies would soon reach £6 million. Four years later, in 1984, the US Office of Technology Assessment indicated that the US market for monoclonals was worth between $5 and $6 million, predicting that this would rise to between $300 and $500 million by 1990. Yet, the rise of monoclonal antibodies had not been a straightforward or inevitable process. It had taken years of work on the part of scientists to demonstrate its utility. Milstein, himself had been at the forefront of this process. Realising he could not leave such a task to others, Milstein quickly shifted, temporarily, from his long-time basic scientific interest in understanding antibody diversity to exploring, with many collaborators, the practical application of monoclonal antibodies. This shows an Argentinian stamp, dated 2005, celebrating Milstein's Nobel Prize. Conscious of his own difficulties as a scientist in Argentina, throughout his career Milstein devoted himself to assisting science and scientists in less developed countries. In March 2000, he wrote trenchantly, 'Science will only fulfil its promises when the benefits are equally shared by the REALLY poor of the world'. In recognition of his legacy, the MRC later created a doctoral studentship in Milstein's name after his death to help support Argentinian scientists who wished to pursue their studies in Cambridge. Away from work, Milstein had a rich life. He enjoying cooking, eating, sailing, cycling, skiing and walking. He was also an enthusiastic supporter of charitable causes such as Shelter and Amnesty International. Milstein died in 2002 from a heart attack, aged 74. First diagnosed with cardiovascular problems in the 1970s, he adhered, thereafter, to a strictly controlled diet and pursued a regular exercise regime. Colleagues recall seeing him taking his regular walk around Cambridge. Accompanied by his dog, Milstein would either take a portable radio to listen to the news or dictate letters into a tape-recorder while walking. Often he would invite colleagues to accompany him on his walks to discuss their work. Those who accepted frequently found it difficult to keep pace with his brisk step let alone keep up with the complex discussion that ensued.